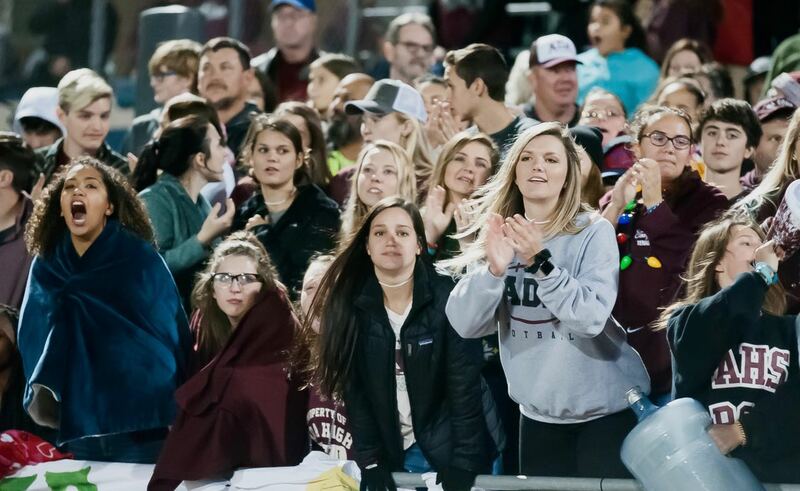 Maleigha Cowart, Olivia Beall, Colbi Hargus, Nicole Lowry, and Sadie Criswell lead Ada fans as they cheer for their Ada High Cougars as they take on Heritage Hall in the Class 4A state championship game Friday night, Dec. 1, 2017 at Choctaw High School. Heritage Hall defeated Ada 14-0 to claim the championship. As usual, I feel like I am starting to know these kids, and as usual, I expect I will feel it when they graduate. Our community, greater Ada, has been supporting their Ada Cougar football team this season more than usual, since they finished strong and charged into a Cinderella scenario with their eyes on the gold ball in the Class 4A championship game last Friday night against undefeated Heritage Hall at Choctaw High School. This panographic image shows the Ada High fans at Choctaw High School as their football team takes on Heritage Hall in the Class 4A state championship game Friday night, Dec. 1, 2017 Heritage Hall defeated Ada 14-0 to claim the championship. Despite being stuck on the smaller visitor side, Ada easily sported three times the number of fans as Heritage Hall. 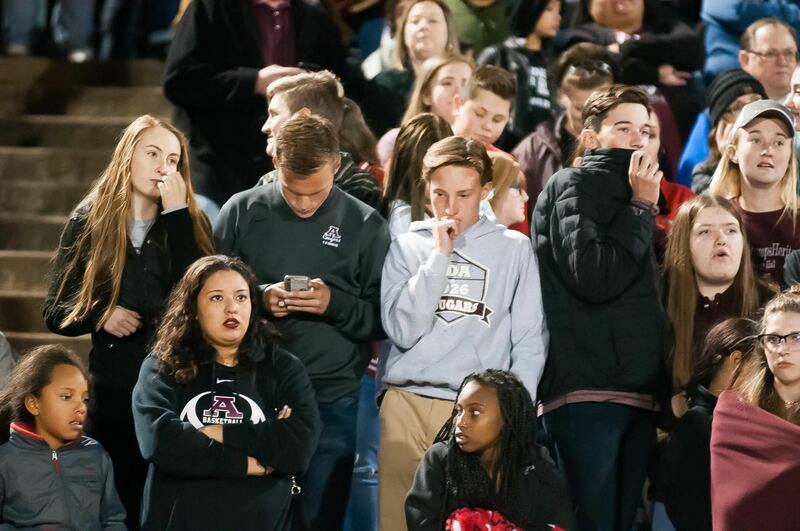 Ada fans look on with dismay in the waning moments of the Ada High vs Heritage Hall Class 4A state championship football game Friday night Choctaw High School. Heritage Hall defeated Ada 14-0 to claim the championship. Sadly, despite a deep gut check by all the players and a huge fan presence, Heritage Hall prevailed in an epic defensive battle for a final score of just 14-0. 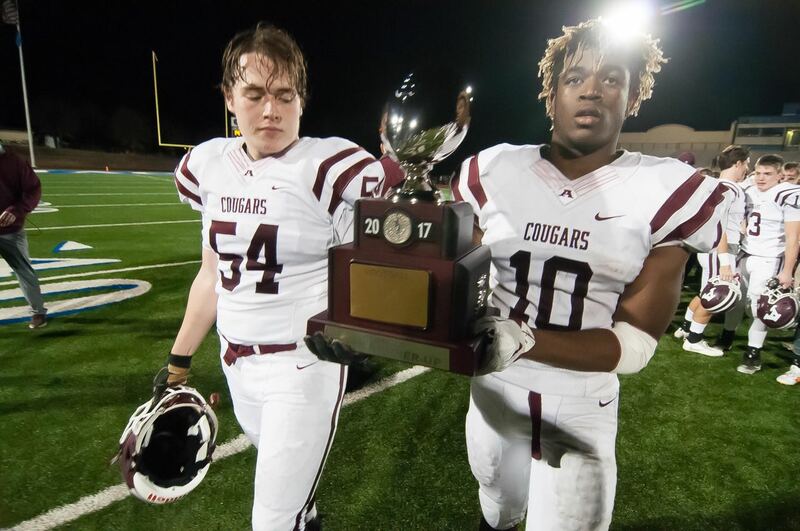 The season didn’t start great, and it initially felt like a “rebuilding year,” with a new coach and some inexperienced starters, but the Cougars got better and got lucky, winning their district, then winning, usually in the fourth quarter, excellent playoff games against Elgin, Oolagah, and Bethany. Seniors Lincoln Gibson and Kylen Cooper bring down a Heritage Hall receiver Friday night. 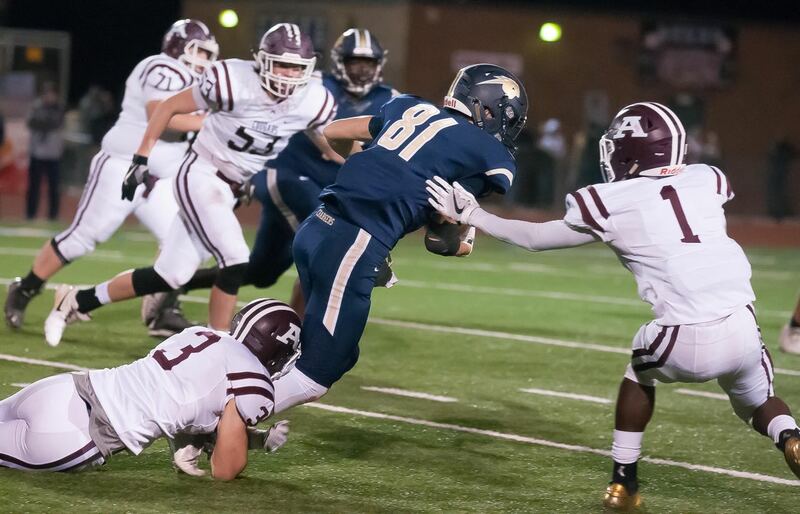 Kylen “Coop” Cooper was a scoring machine all year long, but was completely shut down by the Heritage Hall defense. 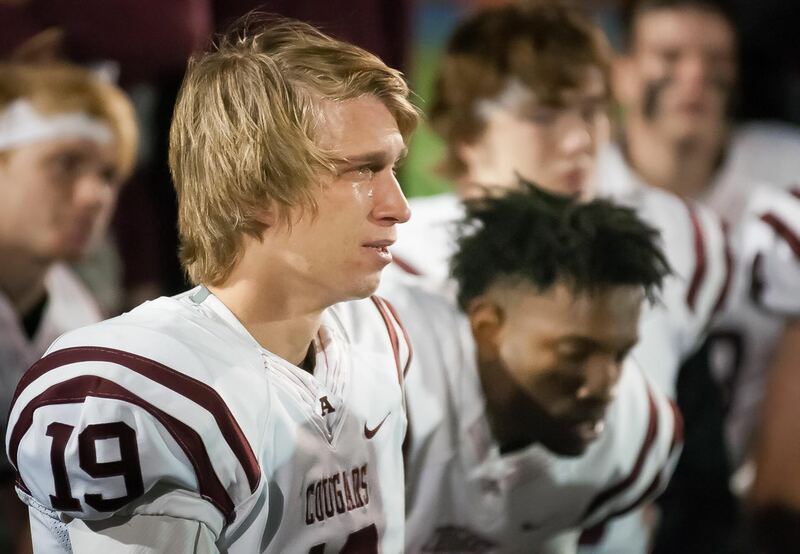 Senior punter Tovan Thomsen can’t hold back his tears at the end of Ada’s 14-0 loss to Heritage Hall Friday night. I covered Thomsen’s sisters, Aneli and Menee when they played basketball at Ada High, and I covered their father, Todd, when we both attended Oklahoma University, including the infamous “Ice Bowl” at Oklahoma State in 1985. In the end, Heritage Hall was just too big and too talented for our scrappy Cougars. Sports is a fickle mistress. Ada fans know that the Cougars have claimed 19 state championships, five of which I have covered. The 20th seems repeatedly out of their grasp. Seasons like these and games like Friday’s are at the heart of what I love about being a photographer, and being a part of a great community. Seniors A.J. Steele and Grant Bellard carry the silver runner-up trophy to the fans Friday night. As bitter as it is to accept the defeat it represents, it is an amazing achievement to receive the runner-up title. Rendering a consistent expressive service in community connection on sport is five worlds in photography I have never seen.